This is a fantastic story of one of America’s greatest athletes and humanitarians. After only three years of competitive lifting, Paul Anderson had become a national hero and world renowned as “THE STRONGEST MAN OF THE CENTURY”. In 1956 he travelled to Melbourne, Australia, were he won a gold medal in the Olympic Games. Paul Anderson – The Strongest Man in Recorded History. This is a fantastic story of one of America’s greatest athletes and humanitarians. After only three years of competitive lifting, Paul Anderson had become a national hero and world renowned as “THE STRONGEST MAN OF THE CENTURY”. In 1956 he traveled to Melbourne, Australia, were he won a gold medal in the Olympic Games. He was the last American heavyweight lifter to do so. By 1957 he had established 18 American and 9 World Records, and in June of 1957 he lifted 6,270 pounds in a backlift: a feat most believe will never be equalled. Many experts have described this modern-day Samson as the strongest man who has ever lived. The present day champions who compete in the World’s Strongest Man can only be modestly compared to PAUL ANDERSON, the greatest STRONGMAN of all time. On February 29, 1992, in Orlando, Florida, at the first USA Power and Strength Symposium, Paul Anderson was recognized as THE STRONGEST MAN OF THE CENTURY. Since the late ‘50s he has traveled thousands of miles each year sharing his message: love of God, Country, and the free-enterprise system. In 1961 he and his wife Glenda established the Paul Anderson Youth Home, which provides Christian rehabilitation for young men who would otherwise be sentenced to juvenile or adult penal institutions. Never before seen photos and movie footage of the strong man preparing for the 1956 Olympics using home made weights in his home and backyard. News Reel Footage from major film studios of his most famous competitions at home and abroad. Although his competitive career was very brief, Anderson may have been the best American weightlifter ever. He won the U. S. heavyweight championship in 1955 and 1956. After winning the world championship by a record margin of 82 pounds, he was strongly favored for the 1956 Olympic gold medal. He had a hard time winning it, which he did while he was recovering from strep throat. Needing 187.5 kilograms in his third lift to match Humberto Selvetti of Argentina, Anderson failed twice but made the lift on his third and final try. He won the medal because he weighed thirteen pounds less than Selvetti. Anderson went on to set many records as a professional powerlifter, including a bench press of 627 pounds, a squat of 1,200, and a dead lift of 820. On June 12, 1957, he lifted the greatest weight ever, 6,270 pounds in a back lift off trestles. See also the book PAUL ANDERSON: THE MIGHTIEST MINISTER by Randall J. Strossen Ph.D. Available on the internet. 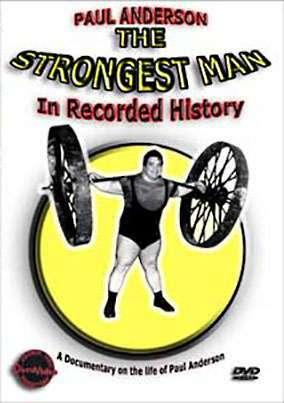 If you are into STRONGMAN DVDs, checkout our listing of ARNOLD STRONGMAN CLASSIC DVDs. If you are into strength and POWERLIFTING, check out our INDEX LISTING OF POWERLIFTER MAGAZINE DVDs.